If pundits tells you something is true, and you don’t have the critical thinking skills to evaluate their statements, then you are putty in their hands, as they shape your world view to their will. Here is the Truth Ratings System, at TruthRatings.org. The site is fully functional, though portions of it are under development. Unless you are logged in all data is view only. Please contact us if you are interested in evaluating and using the system to produce claim-checks. This is an open-source project and use of the system is free to bona-fide claim-check organizations. Here is a document on Evaluation of Claim-Check System Components. 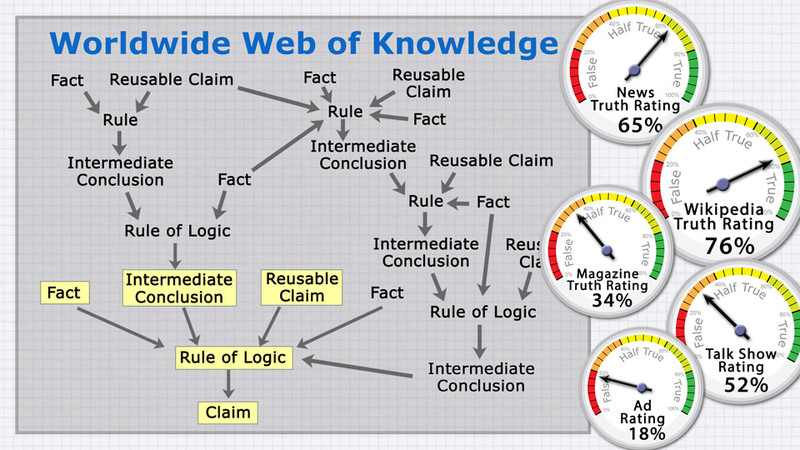 This summarizes the architecture and quality of the components making up the claim-check system. The goal of this project is to raise political truth literacy enough so that lying is no longer the winning strategy, as it is now for the wave of populist and authoritarian politicians we are seeing around the globe. Instead, telling the truth (about what's best for the common good) becomes the winning strategy. Once that happens everything changes because the human system has undergone a mode change. Instead of the system serving powerful special interests, which is who populists and authoritarians are really serving, the system now "wants" to optimize the common good of all. 1. Education on how to spot commonly used fallacies. Lying politicians use the same fallacies over and over, like false dilemma, ad hominem attack, cherry picking, and strawman. They also use the same fallacious strategies over and over, like false promise and false common enemy. 2. How to use Politician Truth Ratings to make better decisions. Ratings help people make complex decisions more correctly. Ratings work so well they are everywhere, like product ratings, bond ratings, wine ratings, and restaurant ratings. But where are the ratings citizens need to make the very complex decision of who to vote for? They are nowhere to be found. Politician Truth Ratings fills that gap. For an introduction to why we need Politician Truth Ratings, how they work, and how this is a new form of journalism, please see this video. Watch in full screen mode so you can see the detail. Use the best speakers or headphones you have since there's a movie-quality soundtrack. These videos are undergoing development. If you have suggestions for improvement or questions, please contact us. "Imagine what it would be like to read any news article and see its truth rating, which would be the average of all the rated claims in the article. And imagine doing the same with Wikipedia entries, magazine articles, talk show transcriptions.... (and so on)"
For a thorough introduction of the analysis behind the Politician Truth Ratings solution element, see the Democracy in Crisis film series. Note that you can examine a graphic summarizing key points in each film by studying the images on this page. These will be hard to fully understand, however, without watching the films. The first generation of this project was called the Political Persuasion Knowledge Base (PPKB). One long-term plan we have is a browser add-on that shows the Truth Rating for news sources, if they have been rated. It will take a long time to reach this point but if we can do it, the add-on will go a long way toward combating fake news, propaganda, and political deception in general. The Truth Rating System can be used to develop ratings for any kind of source, not just politicians. Here is the Truth Ratings System. Please note it's an early version and currently runs only in Chrome on Windows and MacOS, thought we've not yet tested it on Linux. The Truth Ratings System can be used to rate politicians, pundits, news organizations, or any source of "truth." But our first priority is rating politicians. This entire project is 100% open source. If you have comments, questions, or suggestions, please contact us. Thanks! Risk 1. Claims cannot be analyzed accurately. In short, the largest controversy among fact-checkers is whether the probability of truth of fact-checks can be accurately determined. We strongly think it can if the right tools are used. Politician Truth Ratings depends on this assumption. But what if we’re wrong? What if a rating cannot be accurately determined? 1. A claim can be objectively analyzed, meaning it will not be biased. 2. A claim can be analyzed in a repeatable manner, meaning different analysts will all arrive at about the same truth confidence level. If an analysis is both objective and repeatable, the analysis closely measures reality and is therefore accurate and may be considered a scientific measure of something. To make analyses objective and repeatable, and thus accurate, analysts follow strict protocols. A protocol specifies how a particular step is to be performed. This is a widely used practice in many industries, like medical procedures, aircraft flight and maintenance, and science procedures. We don’t yet know what the protocols will be. Fact-checkers follow established protocols and are trained in their use. We expect the TRS protocols will use these as a starting point and evolve the rest, based on study of tool use. Once TRS can produce claim-checks, we can begin experimentation on claim analysis accuracy. A long series of experiments will allow us to converge on protocols that produce accurate results within a certain range, called the analysis accuracy error. Once we know this range, for a Politician Truth Rating it will be added to the margin of sampling error to give the margin of rating error. For a claim-check, the margin of error is the analysis accuracy error. We expect that the simpler an argument is, the lower the analysis accuracy error. This may give rise to levels of claim complexity. The more complex, the lower the accuracy and the larger the error. There’s a lot of interesting research ahead in this project. How we plan to get started is briefly described in the Help documentation in the section on Prototype limitations and testing. If we cannot bring the cost of analyzing one claim down to a very low amount, organizations will find it too expensive to produce Truth Ratings. The cost is mostly labor, i.e. how long it takes a person or team to analyze a claim. 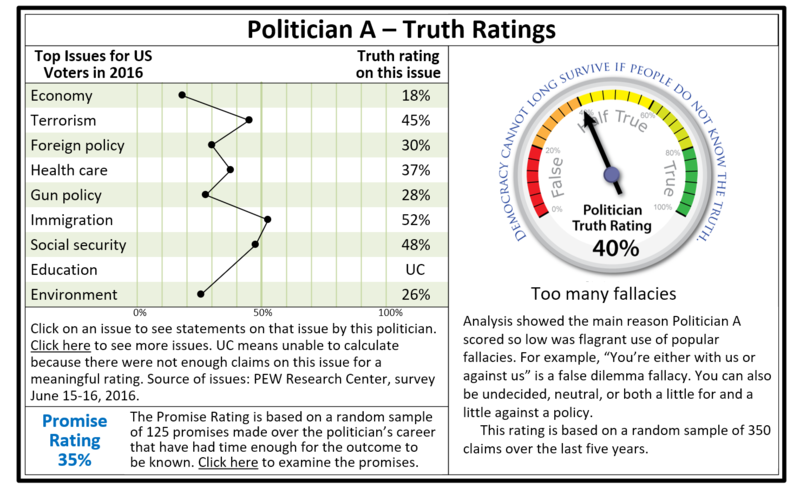 Calculating a Politician Truth Rating requires averaging hundreds of randomly selected claims. Suppose total claims for a politician is 2,000. For a margin of sampling error of +/- 3%, which is what polls use, we need a sample size of 696 claims. That's a lot of claims! Here are some very rough estimates. Currently it takes fact-checkers several hours (?) to prepare a fact-check article for a new claim. Let’s estimate this is two hours at a minimum. 2 hours per claim times 696 claims equals 1,392 hours of labor. The median journalist salary in the US is $36,000 per year. Analyzing claims is skilled work, plus there’s organization overhead, so let’s up the salary to $50,000 per year. At 2,000 hours per year, 1,392 / 2000 times $50,000 equals $34,800 to create one rating. That’s unaffordable for all but the largest well-funded organizations, because there are so many candidates to rate during election season. Therefore, TRS must cut this time by an order of magnitude, and thus cut the cost to about $3,480 per claim. That’s affordable. The text editor and argument map are designed to let users work as fast as they can think, type, and use the mouse to mark nodes and create a map. We expect that with practice the tool will allow users to analyze claims at almost the speed of thought. Like a good word processor, the tool will not be in their way. 1. Eventually, after many claims are entered, 90% or more of the Rules, Facts, and Reusable Claims needed to analyze a claim will already be in the database, because what politicians say contains a high amount of repetition. 2. Extremely fast lookup of a needed Rule, Fact, or Reusable Claim from the database and use of that node in the text. For each of the three database node types, users can search node summary and description, and for rules, by exploring a tree of nodes. 3. A smoothly working, highly intuitive, easy to learn text editor and argument mapper. To speed up managing this risk the prototype doesn't produce ratings. It only analyzes claims. This allows us to address these two risks simultaneously as we proceed with the work described in the Help documentation in the section on Prototype limitations and testing.